Back in May, BVWire reported that an exposure draft was in the works concerning global quality control standards for valuations. The exposure draft has now been issued, and it’s the first project in a new collaboration between the International Association of Consultants, Valuators and Analysts (IACVA) and the World Association of Valuation Organizations (WAVO). Comments wanted: At IACVA’s International Valuation Forum in Atlanta earlier this year, Bill Hanlin (Hanlin Moss Yi, PS), IACVA president, announced that Business Valuation Resources would help disseminate the exposure draft, Proposed Quality Control for Valuation and Appraisal Practice. It is now available on BVR’s Global Business Valuation Resource Centre under the “Articles” tab. IACVA and WAVO offer these standards for voluntary adoption, and they welcome all comments and suggestions for improvement to the proposed standards. Comments are due by October 31, and you can email them to: info1@iacva.org (to the attention of Jenny Wang). The proposed standards put forth a peer review process similar to what’s used in the accounting profession and which can also serve to head off government regulation in this area. “The Quality Control standards are the first step in having firms adopt a system of quality controls to ensure that all of the firm’s practitioners adhere to the same requirements for documenting each engagement,” say IACVA and WAVO in a joint statement. Can a solo practice have commercial goodwill, and how do fair market value and the notion of a covenant not to compete (CNTC) fit into the picture? A recent Texas divorce case raised all of these questions and resulted in a predictable outcome. Non-transferable goodwill: The husband was a licensed financial advisor. At trial, his expert emphasized the fact that sales depended on the husband’s cultivating his own clients. Trust in the husband’s advice was one reason why it would be difficult to transfer the clients to another professional. Also, the husband sold products based on his evaluating a client’s needs. Under an income approach, the expert found the business was worth $443,200. At the same time, he said that under the applicable fair market value he “went straight to the net assets of the business” because, without a noncompete agreement in place, “nobody would pay a penny more than the net assets of the business.” That value was only $27,000. The husband was unlikely to sign a noncompete for less than $500,000 to $720,000. This amount “would be a proxy for the intangible value of [Husband’s] personal goodwill” based on using an income or market approach. The wife’s expert used an excess earnings approach, which, he claimed, for years the IRS and the courts have accepted for valuing small, professional practices. Determining personal goodwill required determining what the risk was to a potential buyer of losing customers. In this case, it was 25% of the calculated value. This was the only amount the expert attributed to personal goodwill. After discounting the capitalized net income by 25% and adding back in the cost of the fixed assets, he concluded the business was worth nearly $413,700. The husband’s expert successfully attacked the use of the excess earnings method. It was disfavored and, if used at all, was only appropriate for businesses with tangible assets. Here, the business had few tangible assets and they were not instrumental in generating income. The trial court credited the husband’s expert and found the business was worth $27,000. The appeals court affirmed, noting, among other things, that the wife’s expert never explained how any commercial goodwill could be attributed to the business “separate and apart” from the professional’s personal skills, ability, and reputation. According to Dohmeyer, the point he has made in his writing and successfully in court is that the business is not going to be sold. The current owner is going to keep the business after the divorce, and, therefore, the value that exists will not be “competed away.” If folklore trumps common sense, the husband gets the business and a low valuation—a windfall. Find an extended discussion of K.T. v. M.T., 2015 Tex. App., LEXIS 8558 (Aug. 13, 2015) in the November issue of Business Valuation Update; the court’s opinion will be available soon at BVLaw. The estate of the late owner of the Detroit Pistons has sued Deloitte Tax LLP to recover $500 million in taxes, fees, and penalties over a tax plan from the advisor, according to a report in AccountingToday. One of the problems involves the IRS taking issue with the valuation of self-canceling installment notes (SCINs). The matter was recently settled, apparently in favor of the estate, according to SRR’s Estate and Gift Taxation Valuation blog, which goes into details about the use of the SCINs. The lawsuit alleges that Deloitte did not adequately disclose the risks of the plan, but the firm says it will fight the lawsuit, says the report. There is a great deal more data in the new, second edition of Benchmarking Identifiable Intangibles and Their Useful Lives in Business Combinations. It has data extracted from over 6,000 purchase price allocations that are vetted and carefully analyzed, particularly focused on useful lives of intangible assets. It includes a review of intangible asset categories complete with detailed descriptions of valuation approaches and checklists of factors to consider. The statistics are presented by type of intangible and are also categorized by industry. Any expert who deals with the value of intangible assets at any level should check out this resource. A recent report from Fitch Ratings suggests a slower growth rate for for-profit hospitals for the rest of this year. One reason for this, they say, is the lack of Medicare expansion during an election year. Another reason is the increased focus on outpatient settings. Hospitals remain under pressure from employers, private insurers, and new payment models under health reform to keep people healthy and out of inpatient settings. This means more hospital revenue will come from the outpatient side of the business, which generates less revenue. The CICBV recently posted a research paper that examines the global differences in business valuation theory and methodology. The paper, “Around the World in Eighty Valuations,” was written by Prem M. Lobo and Matt Bottomley, finds that, “on balance, there are geo-professional differences in the approach to and the application of business valuation theory and methodology around the world.” The authors note that there are a number of differences with respect to valuation reports, including the level of detail used, the degree of disclosure of key assumptions and scope limitations, whether conclusions are arrived at by averaging different methods or using one method, among others. Independence issues: The authors say they are “concerned” that they found that arbitrators have a “generally skeptical view” of valuation experts and their reports. “This is certainly not a view that the valuation profession should allow to linger,” they write. The authors recommend that additional standards addressing ethics and independence would help. This year, the National Association of Certified Valuators and Analysts (NACVA) has introduced a series of regional “specialty conferences.” The next one will be in Houston October 18-20 and will focus on financial forensics and expert witness strategies. For the valuation analyst, forensics especially comes into play when calculating lost profits and business damages. The conference will include a number of sessions related to the use of forensics in lost profits/damages engagements. There will be two keynotes: one by the Honorable Christopher P. Yates, a Michigan circuit court judge, and one on building a valuation and forensic litigation services practice, conducted by Mel Abraham (Practice Builder Academy). For more information, click here. NACVA’s other regional specialty conferences will be held in San Diego (November 16-18) (www.nacvanation.com/sandiego/) and Fort Lauderdale, Fla. (December 6-9) (www.nacvanation.com/ftlauderdale/). In 2012 and 2013, The Appraisal Foundation hosted two roundtables that addressed key issues on valuation qualifications, standards, and oversight. The third roundtable will be held during a one-day event, Valuations in Financial Reporting: Status Report and the Road Ahead, on October 5 in Washington, D.C. This session will focus on the status of various initiatives that are currently in progress aimed at bringing greater consistency to valuation standards and practices for financial reporting. BVWire attended the last roundtable, and we will be at this one, also. To register for this event—there is no charge to attend—click here. It will take place at the Westin Washington DC City Center (1400 M Street NW). People: Curtis Bernstein, director of valuation services for Altegra Health in Denver, was honored by Becker’s ASC Review as one of the “Rising Stars Under 40” who have made an indelible impact on the ASC industry … Katie Gilden, principal of the Forensic Accounting and Litigation Services Practice at Fiske & Co. of Plantation, Fla., was listed by CPA Practice Advisor as one of its 2015 “40 Under 40” honorees … Joseph Kask will succeed Carl Johnson as the next managing director of the Connecticut-based BlumShapiro, effective Jan. 1, 2016 … Ethan Lee, associate at Pacific Business Valuation based in Haleiwa, Hawaii, was appointed as the AICPA’s ABV Champion for the State of Hawaii and also will serve on the Forensic and Valuation Services Executive Committee for the 2015-2016 year … Suzanne Lozano, principal, who leads the Management Advisory Services Group in the Saginaw, Mich., office of Yeo & Yeo, was named one of “Four Women to Watch” in 2015 by the Michigan Association of CPAs … Jenny Stack has joined KC&G Business Appraisal Associates of Salina, Kans., as a business valuation analyst. Firms: Albert Stowe CPA, based in Portsmouth, N.H., will be merging into Baker Newman Noyes (BNN), one of the top five firms in New England, as of November 1, and all employees will relocate to BNN’s new office in Portsmouth … The Texas firm HSSK announced an affiliation agreement with Nouvelle Analytics, an independent consulting firm specializing in the valuation and licensing of patents and other intangible assets, complementing the full litigation and business valuation services that HSSK already offers … Kreinces Rollins & Shanker (KRS) has won in the “Best Practices” competition sponsored by the Commerce and Industry Association of New Jersey and Commerce magazine … The Mobile, Ala., firms McKean & Associates PA and Crow Shields Bailey PC have merged and will operate under the name Crow Shields Bailey PC and employ more than 40 staffers throughout the Gulf Coast region … Meaden & Moore (M&M) and LBC International Investigative Accounting Inc. have signed a strategic agreement to incorporate M&M’s 11 U.S. offices and 70-member staff with the four Canadian offices and 25-member staff … The national firm Sikich LLP based in Chicago was named to the 2015 Inc. 5,000 list of the fastest-growing U.S. private companies for the third consecutive year. Working Capital and Value: Gone But Not Forgotten? (October 6), with Glen Birnbaum (Heinold Banwart Ltd.) and Kevin Yeanoplos (Brueggeman and Johnson Yeanoplos, PC). Why You Need to Use Local Market Rates for FMV in Physician Compensation and How to Calculate Them (October 8), with Mark O. Dietrich (Mark O. Dietrich, CPA, PC) and Timothy Smith (Ankura Consulting Group LLC). This is Part 5 of BVR's 2015 Special Series on Healthcare Valuation. 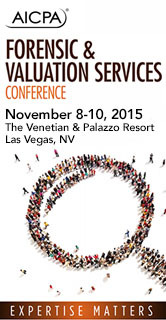 Valuing Full-Service Restaurants (October 15), with Lynton Kotzin (Kotzin Valuation Partners).